A couple of years ago, I took the pledge to ask all clients “Did you Serve?”. Here is a link to my profile page. 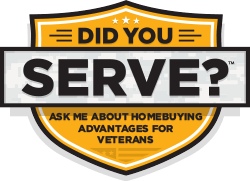 Did You Serve is an initiative to help make sure all Veterans know about their VA benefits for purchasing a home. I have since assisted several families in purchasing a home with a $0 down payment using their VA benefits. It has been a true joy AND an honor to work with each of these families. They have all touched my life and I am blessed to now consider them friends. The problem we run into is that many people are not familiar with the VA Loan Process. And even after 7+ years of handling VA purchases, I am still learning! With each and every transaction I have that is a VA loan, I have learned something new. The start of my VA loan knowledge came from becoming part of the “Did You Serve Initiative“ a few years ago. In addition, I have a couple of great lenders who are very knowledgeable in this area and they have provided me with necessary information to better serve my clients. I am also taking a class to provide more knowledge and added credentials. I never want to stop learning. I recently had a client speak to a listing agent without me present and she recommended a lender – whom he called for additional information on his VA Loan or the qualification process. He was given misinformation and it almost cost him a home. Long story short, my client did not end up purchasing that home (though he initially liked the home) nor did he use that lender. He actually already had a lender…a great lender who got him pre-approved for a loan in just one business day after the client and I phoned for proper info. He sure seemed thrilled to have a better outcome and we have since submitted an offer on another home – with more square footage and a gorgeous setting! Or do you know someone who did?Please listen to the video and share this blog link with others you know who may be ready to purchase a home using their VA benefits. I’d be honored to assist you in your home purchase!